Romana’s Pilates is a style of Pilates that teaches the exercises and philosophies of Joseph and Clara Pilates. These teachings were directly handed down to Romana and her daughter Sari by Joseph & his wife Clara. This is what we call “True Pilates”. Romana Kryzanowska is the world renowned protege of Joseph Pilates and has been teaching the method for nearly six decades. Romana made a commitment to Joseph and Clara to continue their life’s work. She continues to deliver on that promise today by traveling the world and teaching the next generation of instructors. 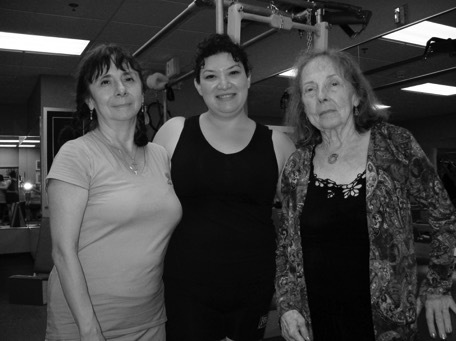 Romana’s daughter, Sari Mejia Santo, shares her mother’s lifelong passion for teaching the Pilates method; she also had the opportunity to train directly with Joseph & Clara Pilates, and has been teaching at Romana’s side for over three decades. Joseph H. Pilates designed more then 500 specific exercises to uniformly develop the body. When taught by a qualified instructor, the “True Pilates” method works wonders. Your body will be transformed through Pilates. You will look, feel, and perform better then any point in your life. Gratz Industries is the original manufacturer of Pilates apparatus and the industry's established source for authentic equipment. Working closely with Romana Kryzanowska in the late 1960's resulted in the preservation of the demensions and proportions critical to the correct functions of the Pilates apparatus. Copyright 2009-2017 ©Pilates Authentica All Rights Reserved.